Long before Sonia Sotomayor became the first Latina justice on the U.S. Supreme Court, Dorothy Comstock Riley was lighting the way in Michigan as the first Hispanic woman to be elected to a state supreme court. 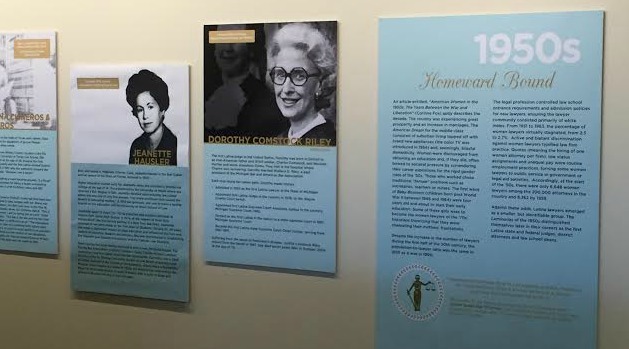 A new exhibit at the University of Denver, called Luminarias de la Ley, features Justice Dorothy Comstock Riley and other notable Latina women in the law. You can read more about the project here. Chief Justice Dorothy Comstock Riley was born December 6, 1924, and achieved many firsts as a woman practicing law during the middle of the twentieth century. In 1976 she became the first woman on the Michigan Court of Appeals. She was appointed to the Michigan Supreme Court in 1982 and elected in 1984. She was selected by her peers to become the second woman to serve as Chief Justice of the Michigan Supreme Court in 1987, and was part of the first female majority court in 1997 (four of the seven justices were women). Chief Justice Dorothy Comstock Riley died on October 23, 2004. Her legacy lives on in the Michigan Supreme Court Historical Society, which she founded in 1988, and in a new permanent exhibit about the First Women on the Court in the Michigan Supreme Court Learning Center. You can schedule a tour of the Learning Center here. Read more about Dorothy Comstock Riley’s life and career here.